In the wake of box-office smashes like The Hunger Games and Divergent comes first-time director Wes Ball’s adaptation of The Maze Runner, yet another sci-fi-tinged tale about a future dystopia that’s based on a popular series of young-adult novels. Unlike those first two franchises, however, this one forgoes having a strong female lead in favor of a menagerie of uninspired male characters. 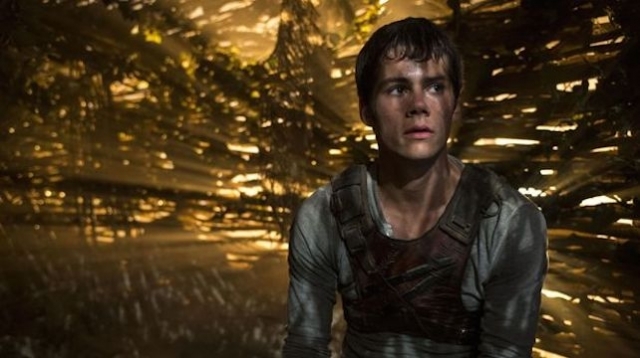 The movie opens as a teen (Dylan O’Brien) suffering from total amnesia awakens in a mysterious moving elevator. He eventually arrives at a large field called “the glade,” which is populated by teen boys who verbally tease him and call him “Greenie.” He becomes disoriented, tries to run away, and eventually falls to the ground—which is when he sees that a towering, monolithic structure blocks his way. The new kid eventually remembers that his name is Thomas, and quickly learns the rules of his disturbing new home. Everyone here is trapped, and the giant monolith is a maze that, at night, is full of frightening half-flesh, half-machine creatures called “Grievers.” Every morning, a handful of boys known as “runners” go into the maze and try to map it, and must get back before the Grievers start their patrol. Thomas quickly proves himself worthy of being a runner; he also shows a talent for leadership, convincing the other boys that they can find a way out, even though none of them has any idea where they have ended up or who brought them here in the first place. The only clue is the acronym “W.C.K.D.” on a number of the materials that are sent to them via the same elevator that brought Thomas to the glade. Filmmakers and screenwriters face a choice about when to begin their story: Explain everything right away, or just drop the audience into a situation and catch them up later. Ball and his three credited screenwriters—Grant Pierce Myers, Noah Oppenheim, and T.S. Nowlin—go the latter route, and for its first five minutes, The Maze Runner succeeds in drawing you into its strange world. Sadly, it never gets better than that kinetic opening, and it quickly becomes a bore to look at and a chore to sit through. Visually, the movie has about four main sets where the scenes transpire. There’s the maze itself, where the action sequences are edited very quickly in order to keep you from noticing how bad the special effects are; the glade, which is bright and green like the shire in Peter Jackson’s Tolkien adaptations; the dark interiors of various huts the teens have built; and the “pit,” the community penalty box where Thomas seems to end up much of the time. For a movie about running, The Maze Runner is visually static, and you quickly grow tired of looking at these places. If we had people to invest in emotionally, that lack of visual variety could be overlooked, but as hard as the young cast tries, none of them can transcend the wooden dialogue and lazy characterizations. Dylan O’Brien is a total blank as Thomas, who seems to possess no genuine special skill in this universe outside of being the most attractive and the ability to keep his hair clean without the benefit of a working shower. Will Poulter plays Gally, a member of the group who constantly discourages any attempt to leave the glade—he argues that they have everything they need, so why shake things up? Poulter is playing a totally different role here from his savvy comedic turn in We’re the Millers; there’s something Brad Pitt-like about his movements and line readings, but the character is as functional as everything else in the movie. Rather than a real person, he seems like just another plot obstacle to overcome. However, Thomas Sangster is appealing as Newt, a character who quickly befriends Thomas and will hopefully have more to do in the promised sequels. Those intended sequels are the single biggest reason why The Maze Runner is such a dud. The filmmakers assume they’re going to have three or four movies to tell this story, so the first installment (like Divergent) sets up a number of things that don’t pay off right now, and merely hint at a tale much larger in scope. You don’t get a whole narrative with The Maze Runner; you just get act one. Because they wait so long to dole out the information, the reveal of what W.C.K.D. stands for—by a slumming Patricia Clarkson—is built up to epic proportions, and the information is so ridiculous that the moment isn’t dramatic but laugh-out-loud funny. Additionally, the storytelling is so lazy that, when it’s time for us to learn the full backstory, Thomas takes a special drug that allows him to remember everything, and then tell the others—and us—what’s really going on. The Maze Runner is a giant waste of time. There isn’t enough “there” there. It should be a 30- or 40-minute beginning to a two-hour movie, not a feature on its own. If it gets made, the sequel might very well be better, but it’s hard to imagine anybody but devoted fans of James Dashner’s source material caring.